After an extended break, I now view some of my frequently shot local venues, in a new light. It is sound photographic wisdom to return to good locations many times in order to shoot different angles and varied lighting situations. It seems that it is also good advice to take a long break from visiting some of those locations, especially when you frequent them because they are close to home. Upon your eventual return, you can gain a fresh perspective and hopefully capture something you had not seen before. Case in point, having been to this spot many times in the past, I returned after a substantial layoff and saw it with fresh eyes. 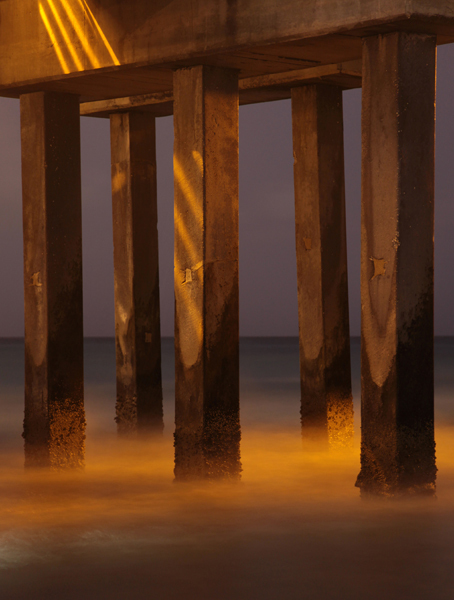 Light originating from the pier shines between the planks and across the beams, pylons and into the ocean surf just as night falls. Even utilizing a tripod and cable release, it still takes a great deal of practise and experimentation to successfully capture the correct lighting and exposure in such scenes. In situations such as this, the fleeting light requires rapid changes in camera settings and length of exposure. Finally, for some reason, when shooting at my local, populated beaches, I tend to attract visitors who are passing by when I am trying to capture the quickly fading dusk light. They are routinely curious as to what I am shooting and why. Now, I try not to be rude, but I have a very limited amount of time as the sun sets. So, if you ever come upon me and my camera on a local beach at dusk, concentrating on the task at hand, what I am trying to do is capture the scene…in a new light.